Before you know it, Belkin’s WeMo will have its hands into just about every kind of device you can think of. It’s already working with light bulbs and humidifiers, and now it’s in the kitchen with its partnership with one of your mother’s and her mother’s favorite cooking appliances: the Crock-Pot. Crock-Pot slow cookers have been around for more than 40 years, and with the inclusion of WeMo, they’ve stepped into the connected world and appear to be headed for another 40-plus years (at least) in the world’s kitchens. 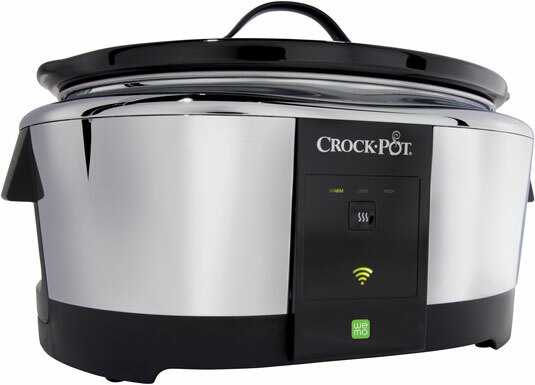 The Crock-Pot Smart Slow Cooker is enabled with WeMo technology, which means you can control it from your smartphone or tablet using the WeMo app. As you already know, convenience is the key to a good home automation device, and this one certainly fits the bill. Sure, you have to put the ingredients into the cooker, but that’s a given until the day comes when kitchen robots can do that part of the job. 6-quart capacity, which is plenteous, to say the least. Enables you to adjust cooking time and temperature, set your food to warm only, or simply turn the cooker off. You can do this from the cooker itself or via the WeMo app. Cord storage on the side of the cooker.